Mouterij Dingeman’s has been supplying the Belgian brewing market with roasted specialty malts since 1875. 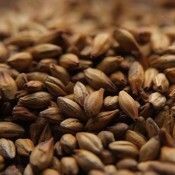 Their Special B malt is the darkest Belgian Caramel malt on the market and is usually seen in Abbey and Belgian styles. However, this specialty grain can add a little something extra to a number of styles. Try it out in your next Stout or Robust Porter for an extra layer of complexity. Special B lends a rich caramel flavor with hints of raisin and brown sugar and in higher quantities can impart notes of leather and candy. Due to the level of caramelization this grain will lend a coppery to dark brown color to your beer and leave a fair amount of body and residual sweetness. Usually seen at 2-10% of the grain bill.